Peter Parolin is currently serving as the Associate Dean of The Honors College. Peter joined the UW English department in 1997. He has twice chaired the department (2008-11; 2014-17) as well as twice serving as Assistant Chair of English. Peter’s areas of research and teaching include English Renaissance literature, especially Shakespeare, women and performance in the early modern world, and the scholarship of food, with special reference to early modern receipt books (recipe books). 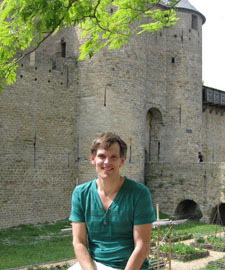 Beyond UW, Peter lectures for a summer seminar series at the Stratford Festival of Canada. In his extra-curricular life, he acts for UW Theatre and Dance and the local company Relative Theatrics. His favorite roles include Rothko in Red, Danforth in The Crucible, Holofernes in Love’s Labour’s Lost, Botvinnik in A Walk in the Woods, Papa/Sims in The Nether, and David in I’m Gonna Pray for You So Hard. Peter also sits on the board of Laramie Reproductive Health. Peter Parolin. “The poor creature small beer”: Princely Autonomy and Subjection in 2 Henry IV,” in David Goldstein and Amy Tigner, eds, Staging Food and Drink in Early Modern England. Duquesne, 2016. Peter Parolin and Susan Aronstein. “‘The play’s the thing’: The Cinematic Fortunes of Chaucer and Shakespeare,” in Chaucer on Screen: Absence, Presence, and Adapting the Canterbury Tales. Ohio State, 2016. Pamela Allen Brown and Peter Parolin, eds. Women Players in England, 1500-1660: Beyond the All-Male Stage. Ashgate, 2005.